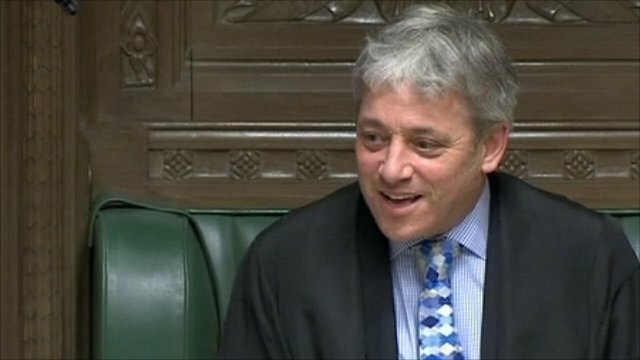 Re-elected Bercow dragged to Speaker's chair Jump to media player MPs cheered as they voted John Bercow back to the office of Speaker of the House of Commons. Cameron tells Speaker: Hold on a minute Jump to media player John Bercow says he is 'very grateful' that David Cameron has finished in a noisy PMQs. Speaker: We don't need to waste time on this Jump to media player An excited Tory MP who tries to ask the prime minister about electricity prices is cut off by the Speaker. Speaker starts to speak out on big issues Jump to media player The Speaker and former Conservative MP has had a few things to say about several controversial issues. Who will be the next Speaker in Parliament? Jump to media player Will Jacob Rees-Mogg, Chris Bryant, Lindsay Hoyle or Douglas Carswell be the next Speaker? MPs vote for an election on 8 June Jump to media player The moment when the vote is announced for an early general election. Miliband 'never knew he was so popular' Jump to media player The Speaker calls for the former Labour leader Ed Miliband to address the House to big cheers from other MPs. Minister warned: Do try to get it right man Jump to media player The Speaker twice warns Tobias Ellwood to withdraw his comments about Emily Thornberry. Is Speaker Bercow being impartial? Jump to media player Nick Robinson, Alan Duncan and John Denham on comments by Speaker John Bercow about hunting. Bercow caught on mic Jump to media player Speaker John Bercow is caught on mic saying that picking a fight with a select committee chairman is "a stupid thing to do". Bercow is a 'more vulnerable' Speaker Jump to media player Bobby Friedman, who has published a biography of John Bercow, claimed the Speaker was "doing quite a good job" but would be more vulnerable than his predecessors in a time of crisis. 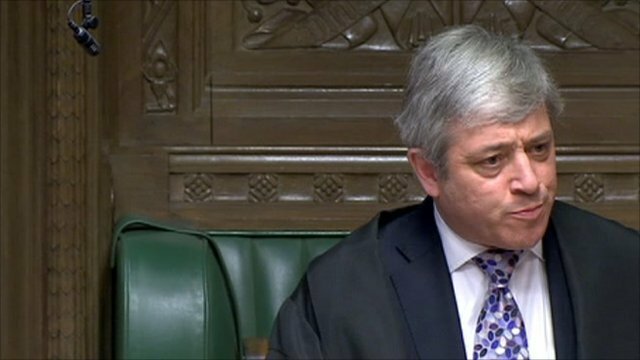 MPs cheered as they voted John Bercow back to the office of Speaker of the House of Commons. Conservatives Helen Grant and Peter Bottomley and Labour MP Alison McGovern took part in the traditional "dragging" of the Speaker from the benches to the chair. There had been speculation there would be moves to oppose the Buckingham MP, but he was re-elected unopposed on Tuesday afternoon.